In his book, On Piano Playing, Gyorgy Sandor identifies two features of beneficial postures: stability and mobility. That is, they support the weight of the body and any instrument while allowing for unconstrained movement. Both stability and mobility maximize physical ease because, for one, they enable larger muscles to do more of the work of music making, taking the load off of the smallest, most vulnerable body structures. A favorable posture at the piano, for example, permits a player to generate power using the muscles in the arms, shoulders, and back. A less-desirable position would delegate excessive work to the smaller finger muscles. 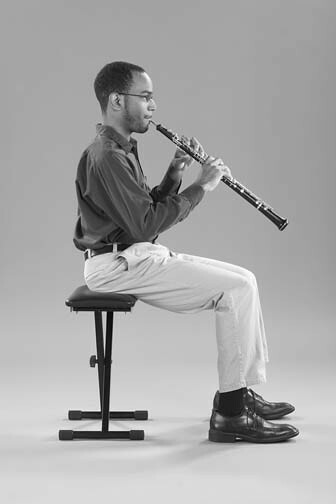 In the photo that heads this post, multi-instrumentalist Ronnal Ford demonstrates stability and mobility by the way in which he sits and plays the oboe – although a photo is static, one can sense how nimbly he can balance and move. Mobility also staves off fatigue because it liberates the muscles to be used in variable ways, enabling a dynamic interplay of contraction and release. By comparison, when musicians uphold rigid postural habits, muscles clench relentlessly, restricting blood flow to those muscles. Waste products then accumulate, and fatigue, pain and cramping can ensue. As an illustration, imagine lifting a suitcase by the handle and holding it a few inches off the floor: soon your hand and arm would tire and stiffen if you didn’t don’t let go. Similarly, when sitting or standing in a rigid manner, static muscle contraction in the back or other muscle groups can bring on spasm and pain. Advantageous postures have an active quality; they’re always subtly in motion. As a result, there is no single “correct” position for sitting or standing, as both involve movement. But there are principles of body alignment and balance that allow for optimal stability and mobility when playing instruments or singing. Musicians and teachers do well to gain understanding of such principles. All told, active postures empower musicians to minimize effort in practice and performance as well as prevent injuries and project ease and enjoyment from the stage. Part III of The Musician’s Way presents far-reaching guidelines for musicians to sit, stand, sing, and play instruments with ease. Dozens of photos are included. 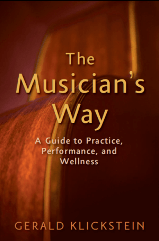 Companion resources – such as links to Alexander Technique sites – are compiled on the Wellness Page at MusiciansWay.com. Adapted from The Musician’s Way, pages 250-251.